While being interviewed for the 1999 documentary Unitas, legendary writer Frank Deford offered “all great quarterbacks are descended from John Unitas.” To which I believe. However the narrative has changed to this generation being descendants of Joe Montana. Some of his performances were so impressive they left sports writers in awe and unlike many of today’s quarterbacks, he was rarely thought of as the best during his time. For all his greatness he was overlooked until the latter stages of his career where he took quarterbacking to an art form. 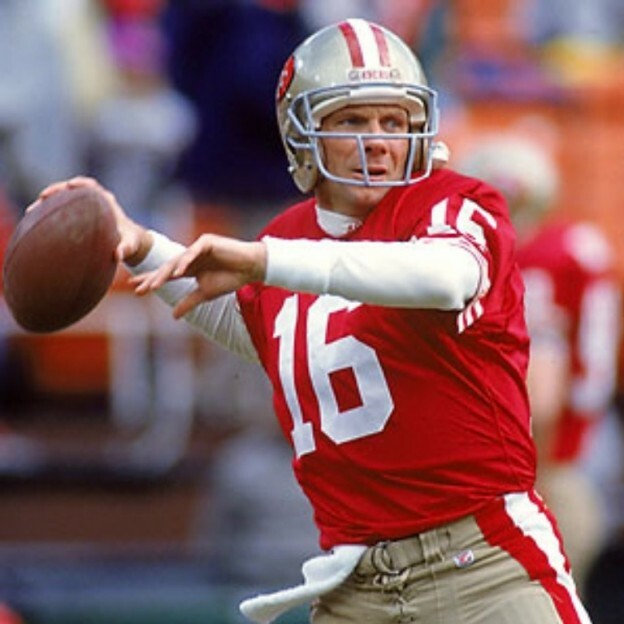 Joe Montana during his San Francisco heydey. Yet if you think back to the 1981 season, folks were waiting for the cinderella 49ers to fall on their face than appreciate Joe that year. It wasn’t until after The Catch in the NFC Championship Game and we were getting ready for Super Bowl XVI did Montana start to get acclaim. It was similar to the attention Colin Kaepernick was generating before last year’s Super Bowl. Part curiosity surrounding his play and part flavor of the month. Remember many writers were reeling at the time having picked Dallas to vanquish him in that ’81 Title game. Then thanks to the surprising Super Bowl opponent being Cincinnati, they were almost forced to talk about him. It was a grudging respect they afforded him. Back in that time the prototypical quarterback was the tall, stout, rocket arm passer. The Terry Bradshaw, Bert Jones, a young Doug Williams, a Ken Stabler, or a Dan Pastororini. The 6’3 guy who could stand amidst the masses and deliver the football 50 yards down field. 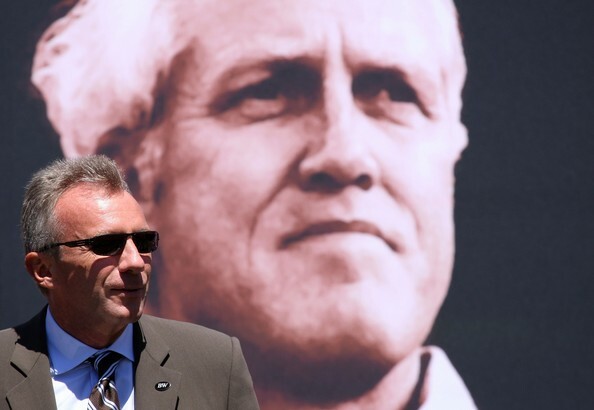 The late Bill Wash even contemplated trading Montana for the right to draft John Elway. Even after that first Super Bowl triumph. Yet it was his size and mobility that set him apart. On every scouting press release Montana was listed at 6’2 200 lbs. but anyone who saw those skinny legs know better. He looked every bit of 180 lbs. They led to his gliding around the pass pocket and avoiding big hits. Whether he scrambled for yardage or he was biding time for a receiver to clear downfield. It was Montana’s nimble feet that kept him in rhythm with his receivers and had his feet ready to throw at a moments notice. Only later was it revealed that those steps were timed with specific receivers to break open and throw at precise moments. That specificity was where Montana elevated quarterbacking to an artform. Another aspect was the ability to bring his Niner teams from behind. The confidence he could instill in his team was on full display during the 1983 playoffs. First he led a last second drive to hold off the Detroit Lions 24-23 to prove The Catch wasn’t a fluke. Then came the NFC Championship with the defending champion Washington Redskins and NFL MVP Joe Theismann. The Redskins jumped out to a 21-0 lead and going into the 4th quarter were laughing their way to Super Bowl XVIII. Then San Francisco Joe got hot. At the time, the biggest come from behind win in an NFL postseason game was 20 points. Yet in the 4th quarter alone Montana threw 3 touchdowns to tie the game 21-21. Only an offensive pass interference (pick play) that derailed a late drive and two questionable defensive calls kept Joe from performing the greatest championship come back in league history. RFK Stadium was silent until those questionable calls robbed fans everywhere of another possible great moment. Motivated by the slight they felt in not being able to determine they’re fate in that championship game, propelled Joe and the 49ers through 1984. The 49ers became the first team to go 15-1 in the regular season in NFL history. In defeating the New York Giants and Chicago Bears during the NFC playoffs, he tamed the next two Super Bowl champions that were led by their defenses. Don’t forget the ’84 Bears record of 72 sacks in an NFL season still stands. He lost the MVP to the power passing game of Dan Marino that year. What did he do to earn the media’s respect ?? He beat Marino in Super Bowl XIX 38-16 and along the way set a passing record of 331 yards and the team set another with 537 yards of total offense. Only when Montana forced the media to vote for him did they award him what he earned. He became a Hall of Famer based on his second Super Bowl MVP. Over the next two years the 49ers retooled their personnel and Montana adjusted to new receivers. Freddie Solomon was phased out retiring in 1985. Dwight Clark was now facing the Jerry Rices and John Taylors that came aboard during ’85 and ’86. Even Roger Craig moved from fullback to halfback. Joe lent continuity to the offense and raised his level of play and took his teammates with him. Those same blood thirsty defenses he sidestepped started getting closer and 1986 ended in the Jersey Meadowlands with a major concussion suffered against the Giants. Although the 49ers would go on to win Super Bowl XXIII and XXIV, it was the 1987 season that was Montana’s zenith. Not only were the ’87 Niners the last team in NFL history to finish #1 in both offense and defense, it was Joe’s greatest season. Due to the player’s strike and injuries, Montana only played in 11 games when he threw a career best 31 touchdowns. Projected over a full 16 games he would have thrown for 45 and possibly challenged Marino’s record of 48. Yet he was beaten for NFL MVP by class of ’83 quarterback and media darling John Elway. Now consider the 49ers had the best record with a 13-2 record vs Denver’s 10-4-1 record and show me where Elway was better. So two years later when the 49ers were up 55-10 in the 4th quarter of Super Bowl XXIV over Elway’s Broncos, how satisfying must that have been?? The ’87 season ended with Montana having the flu and playing in his worst playoff game that saw him benched. The 36-24 upset loss to the Vikings in the NFC Divisional is what propelled the 49ers play in an unprecedented run during the 1988,1989, and 1990 NFL playoffs. They came within :02 of having the chance of a threepeat. However Joe was knocked from that game and was out of football for two years. 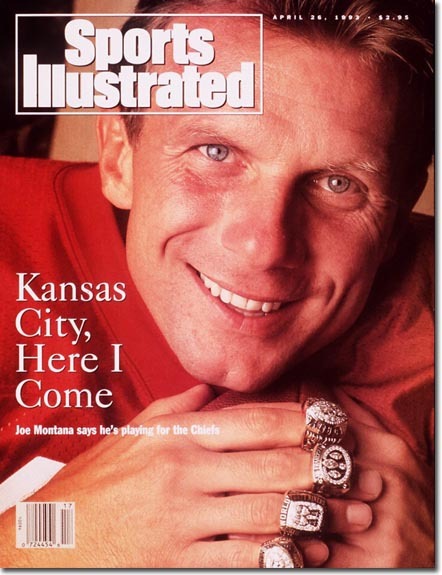 As we look back, think about some of Joe Montana’s exploits. To win Super Bowl XIX & XXIII, he beat reigning MVPs Dan Marino and Boomer Esiason. In winning his record 3rd Super Bowl MVP, he beat the QB he was almost traded away for in John Elway. During those 4 Super Bowl wins he went 83 of 122 for 1,142 yds 11 touchdowns and a completion rate of 68%. He never threw an interception in the Super Bowl. He came close when the late Lewis Billups of Cincinnati cut in front….but i digress. Now we talk about his coming back from back surgery, concussions, or being out of football for 2 years, then leading the Kansas City Chiefs to their only conference championship appearance in 40 years. Consider the greatest pass rush in NFL history was the ’84 Bears with 72 sacks. He beat them in the NFC Championship 23-0. The second greatest was the ’89 Minnesota Vikings of Chris Doleman and Keith Millard with 71 sacks. Montana carved them up something special in a 41-13 NFC Divisional blowout. In Super Bowl XXIV, he beat the #1 scoring defense with a 55 point scoring barrage where he threw a record 5 touchdowns. It was the four year run from 1987-1990 that changed the landscape of quarterbacking in the NFL. Everyone was looking for their quarteback to run the “West Coast Offense” as Montana had. Then you had the coaches in Dennis Green, Mike Holmgren, and Mike White go abroad preaching the gospel of the offense. 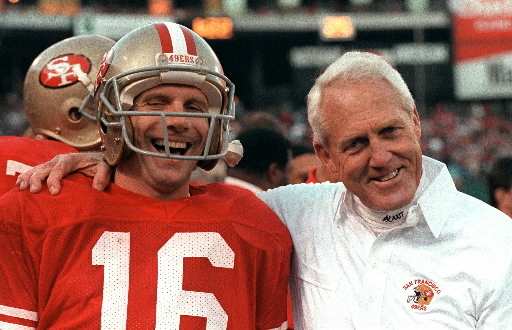 Former Head Coach Bill Walsh had left the 49ers after 1988 and watched Montana’s mastery of the offense he fathered, reach record heights over the next few seasons. Maybe Walsh knew what he was doing when he let it out he was looking at Elway. Then challenged Joe when he brought in Steve Young from Tampa before the 1987 season. No matter what pundits make of these events, they pushed Montana to become the best quarterback he could be. He finished with a 4-0 record in Super Bowls and 16-7 playoff record along with countless completion records. NFL executives have changed the rules over the last 15 years to make pedestrian quarterbacks look more Montana-like. What made Montana special was he was the first Hall of Fame caliber quarterback who went on to success with his 2nd team. The magic spoken of in the vid followed him to Arrowhead while the 49ers lost back to back NFC Championship Games to Dallas. Both years in Kansas City he carried the Chiefs to the postseason. 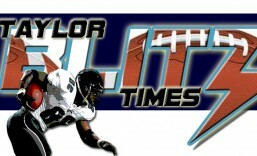 His 1st season (’93) began with a 27-24 wildcard win over the Pittsburgh Steelers. Montana threw the game tying touchdown on 4th down to Tim Barnett with just seconds left. The 1st playoff win for the franchise since Super Bowl IV. This would have been enough for most Chief fans but the encore was one for the ages. Kansas City earned an all expenses paid trip to Houston for the AFC Divisional playoff. The Oilers finished the ’93 season with an 11 game winning streak and had hired Buddy Ryan who recreated the ’85 Bears with a talented roster. During the streak Houston had knocked out 5 quarterbacks and now faced 37 year old Joe. In one of the NFL’s defining games of the decade, Montana was battered in the 1st half yet bounced back with 3 touchdown passes in the 2nd half for a 28-20 win. You could see Montana breathing life into his offense as the game wore on. It was a triumph of perseverance as the Chiefs came within a game of the Super Bowl for the first time in 24 years. An incredible run… had he won the AFC Championship in Buffalo, he could have faced the 49ers in a dream Super Bowl matchup. Alas it was not to be. The next time someone wants to talk greatest ever quarterbacks and doesn’t start with this man, they clearly don’t know what they’re talking about. Don’t tell me what a quarterback was voted, show me what he earned on the field of battle. How did he fare against the best competition during his time?? Competition between his offense and opposing defenses and against opposing quarterbacks. Would his contemporaries pick him as the quarterback on their side in a big game they had to win?? You come to those conclusions and you have a best ever quarterback. Not the quarterback that sports writers want to be. Big difference. Epilogue: So they’re arguing on the radio if Tom Brady wins this Super Bowl, will he be the best over Joe Montana?? The answer is no… I saw Montana play his best against history’s best defenses. Montana played when QBs got knocked out, Brady can’t get hit and ducks for cover when he faced the Giants pass rush twice in the Super Bowl. He beat the #1 defense in the ’84 Chicago Bears, who set the record for sacks (72) in the NFC Championship 24-0. In 1989 Joe beats the #1 defense in Minnesota Vikings, who were #2 in history with 71 sacks, carves them up 41-13 in the NFC playoffs. Then beats the #3 defense who gave up the fewest points in the league in Denver and drops 55 in a 55-10 Super Bowl win. In the four Super Bowls he never threw an interception in, once (1989) he was the NFL MVP. Did you know to win his other 3 he had to beat the 81 MVP Ken Anderson to win Super Bowl XVI, the ’84 MVP in Dan Marino in Super Bowl XIX, then the ’88 MVP in Boomer Esiason in Super Bowl XXIII?? So Joe was great against great teams and great quarterbacks… bring your argument son!! I got Super Joe! !